How will I cook without electricity or gas if it ever comes to that? Solar energy can be very easily harnessed to provide a means of cooking food. In fact, solar cooking has several advantages over conventional oven or stove-top cooking! It’s simply a matter of a box with a clear lid to allow the sun’s rays in while trapping some of the heat inside. From that basic guideline, there are many methods to fine tune the efficiency. The picture above is one of the first solar ovens that I built a number of years ago. It is a simple box oven with a glass cover and one mirror reflector. I actually built it from an old chest that had outlived its usefulness inside the house. I built a slightly smaller box (from plywood) to fit inside the old chest, allowing for about 2 inches of space between them all around, which I filled with insulation to keep more of the heat inside. The inside walls of the inner box are covered with mirrors which reflects more of the heat from the sun onto the pots and pans. I set on the bottom a 1/4 inch aluminum plate (painted black with high-temp BBQ paint) which serves the purpose of absorbing more of the excess solar energy to be transferred to the pots of food which sit on top of it. The plate itself was sitting on 2 narrow wood strips to keep the majority of its surface up off the bottom (to reduce heat transfer out the bottom). The pots or pans should be black to absorb the sun’s energy and should have a cover. The top of the solar oven box is covered with glass which is necessary to keep some of the heat inside. There are quite a lot of different ways to make a solar oven, but the principal is always the same – to capture the energy from the rays of sunshine. Although some solar oven designs can raise oven temperatures up to 400 degrees Fahrenheit (200 C), the majority of simple designs will not get that hot. Instead, a typical temperature may stabilize around 250 F (120 C). This is actually a perfect temperature for slow cooking most foods! Check this out… One advantage to solar oven cooking is that you don’t have to worry about the meal overcooking and burning. You can put the food in the oven at any time and not worry about it until when you decide to eat it later (assuming there is sun in the sky long enough to cook thoroughly). So long as the solar oven temperature is above 165 F (75 C) long enough to heat the food to that temperature, all bacteria will be eliminated and the food will be safe to eat (I keep an oven thermometer inside). Having said that, I found that it really isn’t difficult to reach temperatures above boiling (212 F or 100 C). Cooking at lower temperatures than a conventional oven takes longer. It’s like slow cooking in a crock pot. The best thing though is, the food itself retains nearly all of it’s moisture and nutrients, and comes out very tender and delicious. Some of the best tasting meals I’ve had, have come out of one of our solar ovens. 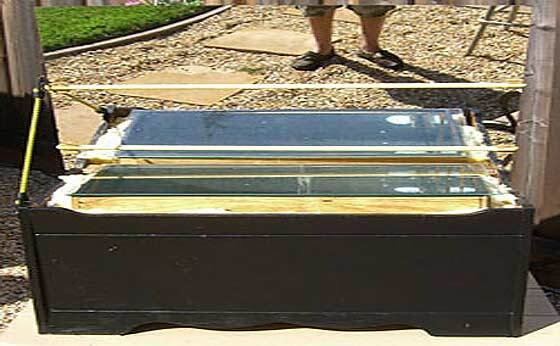 Consider a solar oven for one of your alternative methods for cooking after the collapse. There are many plans on the internet where you will find lots of information, ovens for sale, and instructions how to build them.